Brisbane - Jacques Kallis took some blame for South African teammate Hashim Amla not challenging his dismissal and missing out on a possible bigger score against Australia in the first Test on Sunday. Amla had reached his third century in four innings against Australia and his 17th overall before he was given out lbw to Peter Siddle for 104. 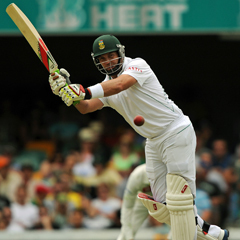 Amla was struck high on his pad and TV replays suggested the ball was going over the stumps. Surprisingly, he did not refer umpire Asad Rauf's decision to the third umpire. Kallis, who later raised his 44th Test century in a brilliant 147 off 275 balls, was at the non-striker's end and said the pair had talked about seeking a review of the decision. "It was a chat that we had, I said I thought it was the height that was maybe the issue there but he (Amla) felt it wasn't going to go over because the umpire had given it," Kallis said. "It was a tough one to call, maybe I could have said just refer it because we did have two referrals left, so maybe I could take a bit of blame for that as well. "Sometimes the batter himself has a feeling, (but) he didn't feel that it was too high, he thought it was probably clipping (the stumps)." It was a memorable day for the 37-year-old all-rounder, whose knock was the highest score by a South African in a Brisbane Test since Eddie Barlow's 114 in 1963. Kallis also chipped in with two catches at second slip to help put the skids under the Australians. He didn't perform in the 26 overs South Africa bowled at the Australians late on Sunday, but said he had no injury concerns. "I'm ready to go, it's managing the workload as well, just got to be careful with that, but as far the body goes, it's alright for the moment," he said. "I was happy with the way I played, it was tough this morning, I thought Oz bowled really well and got the ball into good areas and with the pitch having been under cover for a day (Friday's washout)." Kallis, lining up for his 27th Test match against Australia and 156th overall, said the Proteas could put themselves in a winning position with early wickets in Monday's morning session. "I think tomorrow morning's a key part of the game for us. If we can nip out a couple tomorrow morning and put some real pressure on Australia. Who knows?" he said. "I think we've just got to give ourselves the opportunity. I think the game's far from dead. There's enough in the wicket as well. "And as long as we keep applying the pressure, that's all that we can do, if Oz play well then fair enough."